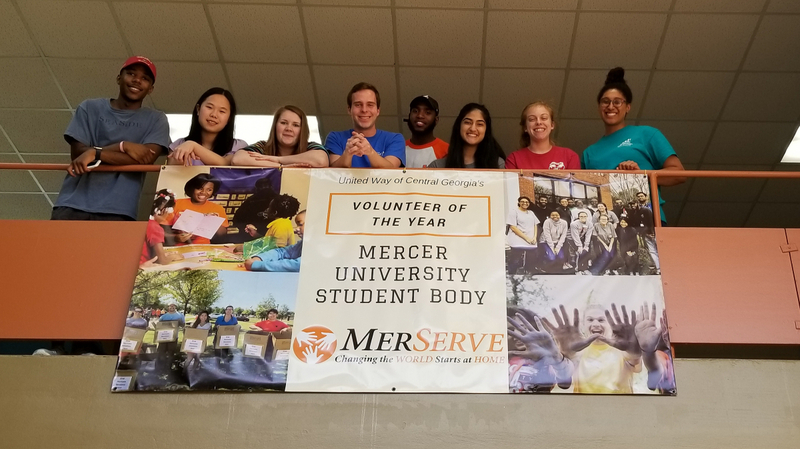 Mercer University honored the student body for receiving United Way of Central Georgia's top volunteering award. A banner now hangs in the Connell Student Center from a railing of the second floor lobby. The award they won is the Lt. Randy Parker Memorial Volunteer of the Year, which is named for the Macon-Bibb County firefighter who heroically gave his life in the line of duty in February 2015. Parker was actively involved in United Way of Central Georgia among many other community organizations. The students pictured above are student leaders from MerServe, which drives volunteer initiatives. (From left to right: William Leonard, Regina Liu, Margaret Rooyakkers, Brandon Jern, Kalon Hightower, Hoor Qureshi, Addie Dillard, and Kaelen Scott. In regard to serving the United Way of Central Georgia (UWCG), about 200 students tutored children to improve their reading skills as part of UWCG's Read2Succeed program.